Two St Martins support workers, Nicky and Alan, are the stars of a podcast recently released by Norfolk-based producers The Back Story. It is one in a series focusing on people whose job it is to help others who are in need. Meeting at Bishopbridge House, company founders Claire Mutimer and Suzy Coulson invited the pair to choose one particular experience that had stood out for them as being memorable. They decided to tell the story of the journey of 27 year-old John, a one-time long-term substance user, with whom they have now been working off and on for some years – and who, says Alan, has made more progress each time. “After having been rough sleeping for nearly a year, he is now living safely and independently, ‘stable on his script’, no longer using and planning for his future. “Three years ago, his life was in chaos; he was a long-term user, in poor health and sleeping in dangerous environments. 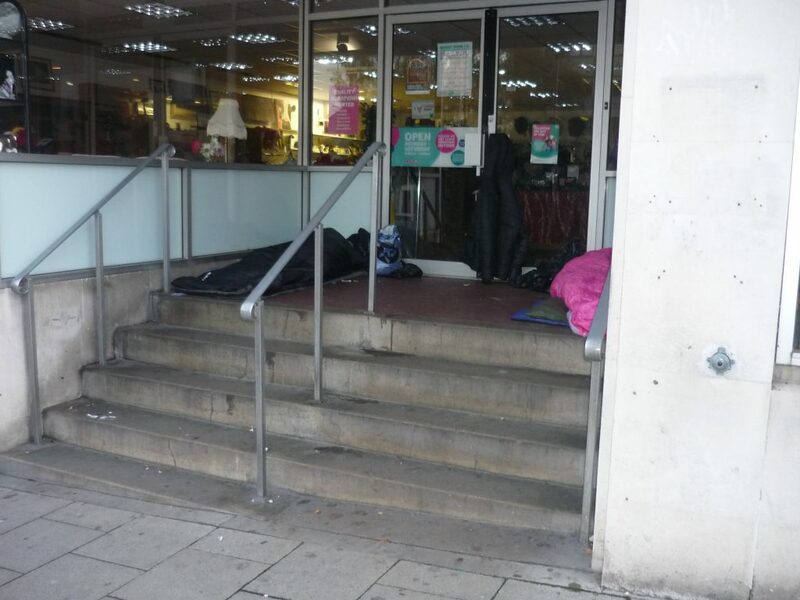 Nicky said, “It makes me laugh when I hear people saying that they feel they’re in danger from rough sleepers. In reality, it’s the other way round. They’re spat on, urinated on…”. “We booked him in to our direct access hostel,”, says Alan, “allocated him a room and a key worker and then set about assessing his health and general condition. The great challenge with someone like John is that he had lost hope, couldn’t trust anyone, been treated horrendously and didn’t feel he had any identity, and his confidence was in freefall”. “When he first came in, staff used to dread knocking on his door when making a welfare call, in case he’d overdosed during the night”. “The day he got his state benefit was a major trigger”, says Nicky. “He qualified on a Monday at midnight. On the Tuesday, he was going for an important test. I lay awake half the night, praying ‘please don’t let him have gone to the bank with his card’. In the morning I asked the staff, ‘is John in?’ ‘Yes’, they said. ‘He didn’t go out at all’. In fact, he’d handed his card in to them . Alan sees John as a very intelligent, opinionated, reserved, quiet person, difficult to reach. He wants his space. “He also came with some very serious domestic baggage. For example, intravenous users are not always very careful about what they do with their sharps and that risks injury. “John was willing to look after his own laundry, but had been reluctant to check whether it it was clear of sharps. So it tended to accumulate, and I was providing a kind of hotel-style room service. Now, however, there’s been a change. When I last offered to look after it for him, he said: ‘No; I’ll do it’. “He’s now living happily in his in his own new flat. The first time I took him there and gave him his front door key, he was very proud of himself”..
“He’s now part of a large, busy community”, Nicky says. “But but his room smells! When he began living rough he was 19. and there have been some development issues. He may be 27 but in many ways he has got the mind of a teenager.When I pointed out his smelly socks, and said he had exchanged an addict’s bedroom for a teenage boy’s, he laughed out loud!”.